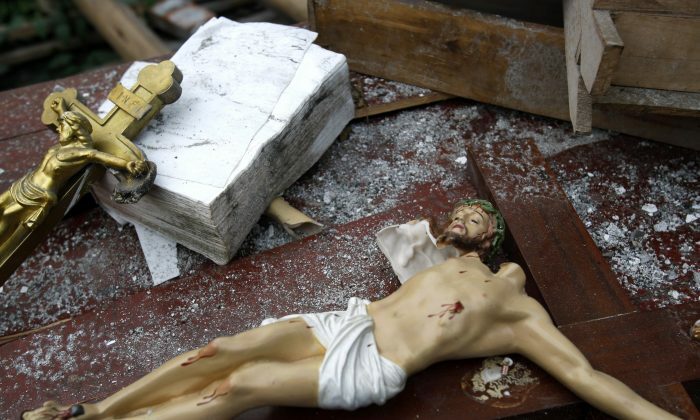 In a recent flurry of repression against the prominent Chinese Christian community in southeast China’s Zhejiang Province, communist authorities demolished two churches on April 13 and 14. One woman was killed in the April 14 demolition when she and her husband, both Christians protesting the destruction of their church in the city of Wenzhou, were buried alive by a bulldozer. The 3-story, 3 million-yuan (about $460,000) Island Head Christian Church, also located in Wenzhou, was torn down on April 13 under the pretense that it had been constructed illegally and that its cross was too tall, according to China Aid, a nonprofit Christian human rights organization based in the United States. While the Chinese Communist Party maintains a strict policy of atheism among its members, it also manages a number of politicized religious organizations that promote the Party line among the clergy of five recognized faiths. The destruction of the two churches in Wenzhou is just one point in an unofficial campaign against Chinese Christianity since 2014. Over 2,000 church crosses have been removed from Zhejiang churches, usually with the excuse of violating building regulations. In March, fifty crosses were taken down in Wenzhou alone. Chinese pastors believe that the cross, being the central symbol of Christianity, does not go over well with the communist authorities, who prefer to keep manifestations of religion out of public view to the fullest extent. Christians in China who do not adhere to the Communist Party-controlled congregations, including an estimated 6 million Chinese who follow the Vatican-based Roman Catholic Church, are subject to physical persecution. Priests have been routinely held in detention or forced labor camps where they suffer torture. This month, five priests were detained by the authorities, and a sixth was found dead in what is officially considered a suicide.